HBO has now aired three episodes of Game of Thrones in the US, and while it doesn’t show here until July (in time for A Dance with Dragons! ), I have been following the discussion anyway. I am not at all surprised that some viewers characterise it as a bleak show — but I think this is an opportune time to dredge up my post from last year asking whether the franchise is really that grim. Yes, it is violent. Yes, bad things can happen to people who deserve better. No, it is neither hopeless nor nihilistic, and that, to me, makes all the difference. A new Game of Thrones teaser has been released, and this one is my favourite by far! Dark (quite literally), visually impressive, atmospheric. Check it out here. A Game of Thrones will premiere in the US on 17 April. HBO has released new publicity photos, visible here. I particularly like the bottom-most picture, which is of Catelyn; it makes her look wise, sad, and strong. Courtesy of Winter is Coming: a list of stations outside the US which will broadcast the series. In Australia, the series will be on Showcase, “possibly in July”. Also from Winter is Coming, a summary of a fifteen-minute, non-public preview video (SPOILERS for the first few episodes). I usually prefer UK (and, by extension, Australian) book covers to their US covers (see Discworld for an example of good British cover art), and Joe Abercrombie’s The Heroes is no exception. Look at this UK cover: yes, it has an attention-grabbing axe and bloodstain, but the axe itself is almost photorealistically drawn and once you look past that, the detailed map says, “Fantasy novel!” without being garish about it. Now look at this US cover, and tell me it doesn’t make the book resemble a trashy slasher novel. Which cover makes the book distinctive, in a good way? And which cover would you rather be seen with, in public? Here comes the ten-minute look at Game of Thrones! As promised by HBO, here’s the long “Inside Game of Thrones” video! It’s also up on Youtube in ten-minute and twelve-minute versions. Mostly, it was the little things that stood out for me. Jaime Lannister’s ornate armour (go to 5:32 on the ten-minute video); it might not be golden but this is just as good. “Littlefinger” Baelish’s sly, mocking tone (2:13). Viserys’ creepy stare (6:19); here is the living, breathing embodiment of a mad Targaryen king. There are snippets that we’ve already seen or heard (such as Ned and Catelyn, and a certain confrontation in the streets), and a scene that I recognise from the leaked pilot script. And we finally have a more precise ETA – April 2011! I look forward to hearing more about the series as we draw closer to April. Author Peter SahuiPosted on December 6, 2010 Categories Speculative Fiction, TVTags a game of thrones, agot, fantasy, tvLeave a comment on Here comes the ten-minute look at Game of Thrones! Right on the heels of my last post, here comes another teaser for Game of Thrones. This one is a full minute and again, looks pretty cool. Again, it focuses on the Starks, but there are cameos by others: Cersei, Dany, Littlefinger and Jaime (? ), Tyrion, and the brothers Clegane. Enjoy! More appetisers for those of us looking forward to HBO’s Game of Thrones! On the Making Game of Thrones site, HBO has recently uploaded twelve large stills that were originally featured in Entertainment Weekly, plus another short (15-second) teaser. On Sunday 5 December, US time, there will also be a fifteen-minute “Making Of” video! I have not analysed the images or the trailer in any detail, but they look great to me upon first glance. Ned and Catelyn look older and fleshier than I’d imagined them, but of course differences between my mental images, and those of the creators of the series, are inevitable. Jaime looks fine in the still image; however, I don’t think a still can really do the character justice. The key to depicting Jaime on screen is his combination of magnetism and arrogance, and this requires that we can see him in motion. So I look forward to future trailers/promotional videos that feature the Kingslayer. Terry Pratchett is, I think, pretty much unique amongst fantasy authors in that he is blessed with good cover art for his novels*. First came the covers drawn by Josh Kirby. Even before I started reading the Discworld novels, I immediately recognised them on the bookstore shelves, courtesy of the glorious, garish pandemonium of the Josh Kirby covers. 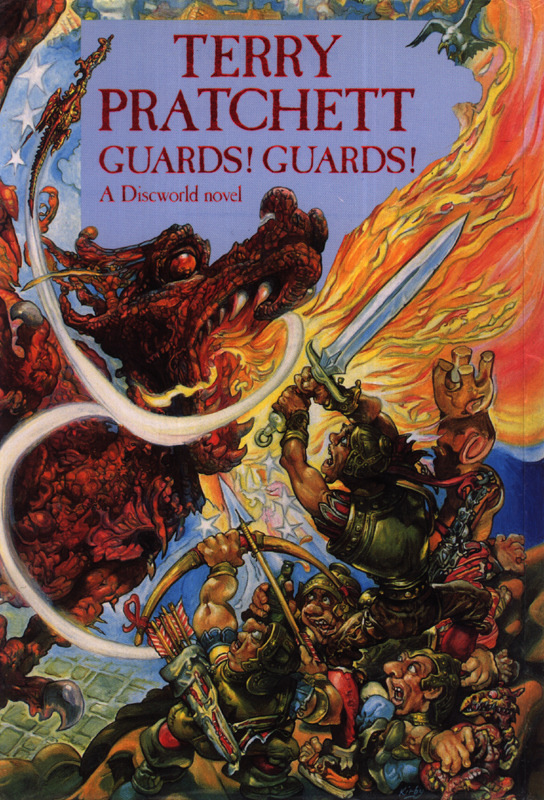 For example, you can see his cover for Guards! Guards! here. While the characters don’t look much like they do in the text, the cover is true to the book in the most important sense. It hints at the kind of reading experience you will, in fact, have: a bellyful of laughs. 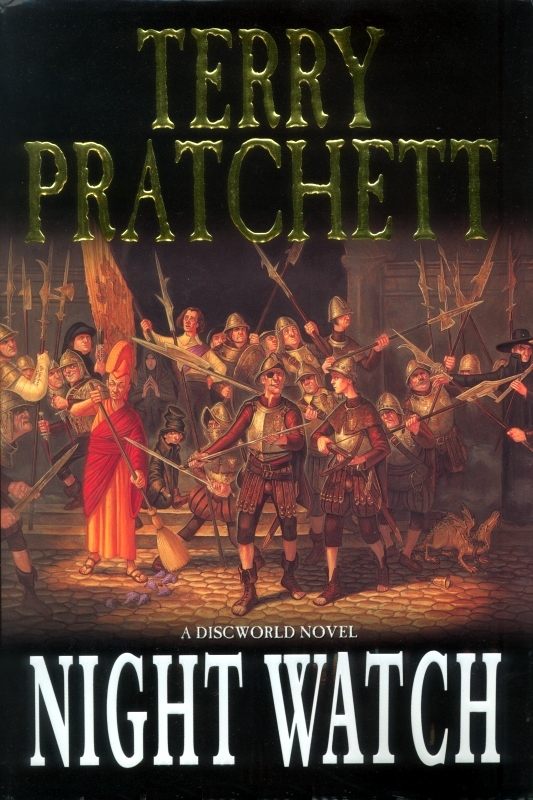 Josh Kirby died in 2001, and in 2002 Paul Kidby took over the cover art with Night Watch. Kidby’s covers don’t have the same manic glee of their predecessors, but they depict the characters very well and retain the comedic touch that the subject matter needs. My favourite Kidby cover is Going Postal, which wonderfully spoofs the “barbarian hero posing atop a mound of bodies” (and I love the gothy Adora Bella Dearhart puffing away on her cigarette). And Kidby’s depiction of Sam Vimes as a Clint Eastwood-lookalike never fails to amuse me. Truly, I would do both Pratchett and his cover-artists a great service to say I could judge the Discworld novels by their covers. * At least in the UK and Australia; from what I’ve seen, the US covers aren’t quite so inspired.